"When pop music and fashion went hand in hand, when a pop group’s stage gear would reflect that fashion and when the album covers reinforced their image." The programme includes contributions from designers Caroline Charles, Barbara Hulanicki (Biba), Jeff Banks and Mary Quant, Carnaby Street historian and former Face magazine editor, Richard Benson, fashion journalist supremo Suzy Menkes, hair maestro Vidal Sassoon, former NME journalist Keith Altham, Lady Jane boutique co-owner Harry Fox and musicians Pete Townshend, Dave Dee, Chip Hawkes, Mick Avory, Dave Davies and Donovan. There is an extract from an interview with the man who helped to run the Apple boutique as part of a collective called "The Fool", Dutch designer Simon Posthuma, and archive contributions from Bill "Vince" Green, John Stephen and John Lennon. Check it out on Tuesday 9th May on Radio 2 from 8:30pm – 9:30pm. I actually have a skirt from Lady Jane of Carnaby Street, given to me when a neighbor visited London in the 60’s. I begged her for “anything” from Lady Jane’s. She gave me a cream cotton skirt with a picture of Carnaby street printed on the front. I never wore it. I still have it With the Original Tags !!!!! Anyone interested? Yes please! How do i get in touch with you? 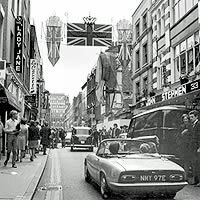 I am related to Henry Moss who was a partner proprietor of Lady Jane’s in Carnaby Street. He is my mother’s nephew. I am currently writing a book about my ancestry and what it is to be jewish too. Although I am afraid I haven’t followed the religion as observantly as maybe I should have over the years. Would love to hear back from you and any stories or photos you could let me have to include in the book would be most appreciated. Was sorry to hear that your father is now no longer here. It’s strange that your name is Sharon Fox because my daughters name is Sharon and I have a daughter in law with the Fox surname also. Take care all the best always Maria. There’s a dress from the Lady Jane shop on ebay right now. sharon I used to live next door to you in oakleigh avenue my dad david cohen was a very close friend and neighbor of your father and of course my sister valerie was your friend. I was a friend of your brother robert. We moved to USA very shortly after Robert’s passing. I still think about him from time to time. Please drop me a line if you get a chance my sister would love to say hi to you.